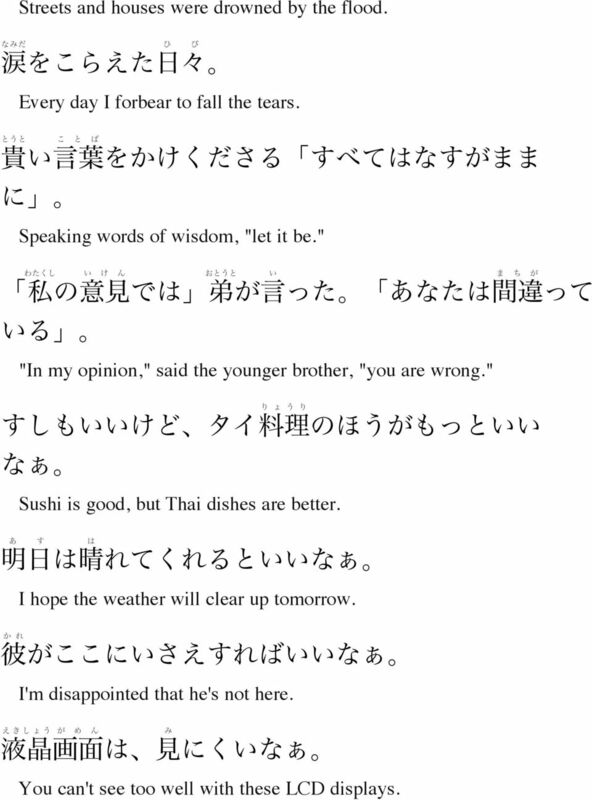 Download "Japanese-English Sentences - Volume 1"
1 Japanese-English Sentences Volume 1 This PDF file was created by using the data available from tatoeba.org on July 21, Only sentences from the corpus with fewer than 100 characters were included. 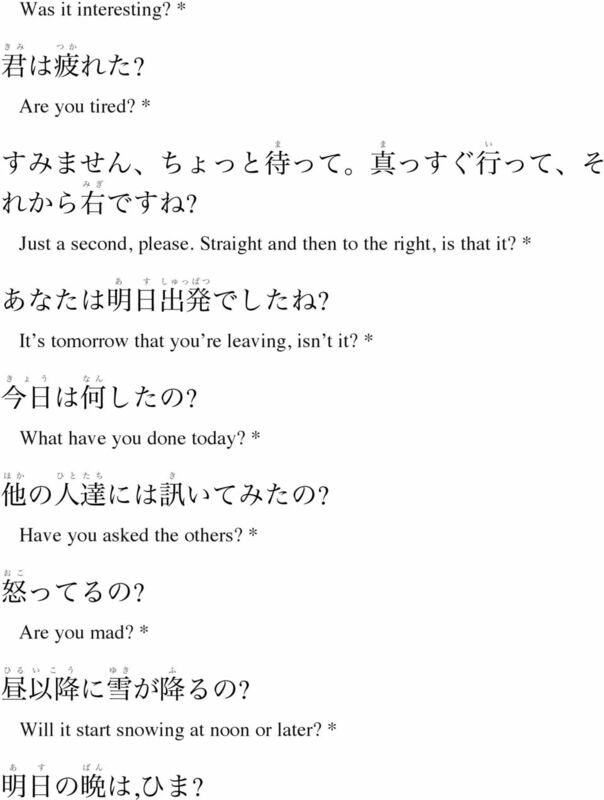 These sentences were then sorted according to how the Japanese sentences end. Please remember that the Tanaka Corpus is not error-free. 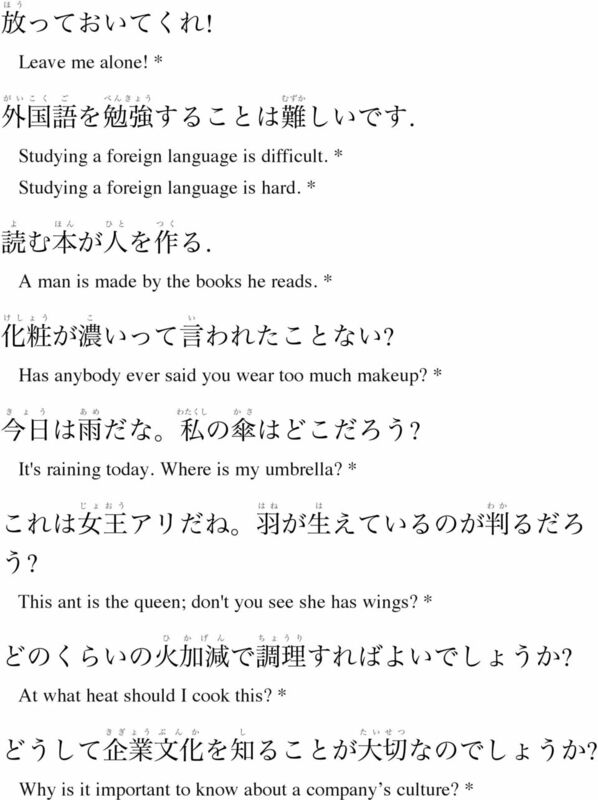 Many of these sentences have not been proofread by native speakers. 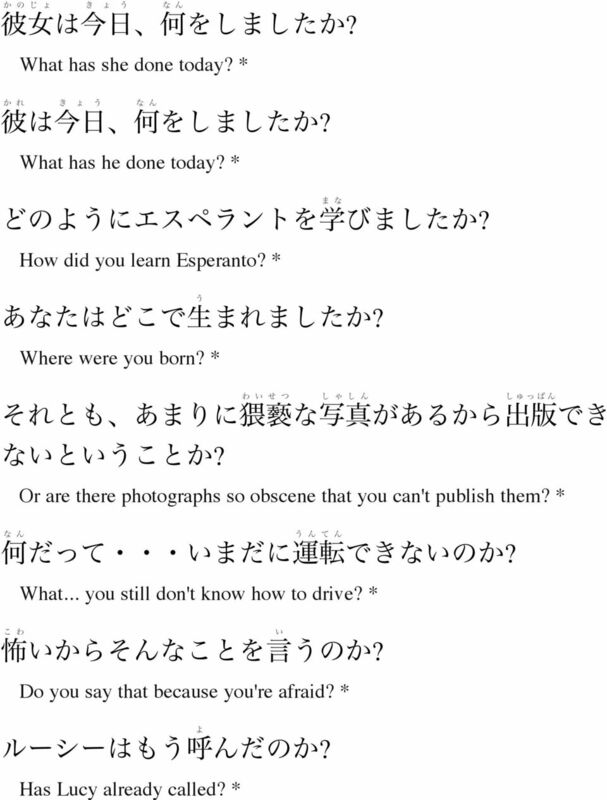 Please read the warning at Also, the furigana may not always be correct. It was automatically generated. The asterisk (*) indicates data that was not used in WWWJDIC example sentences.! Come here! *! I can't wait for Valentine's day! *! Since we aren't vegetables, we should live our lives to the fullest. 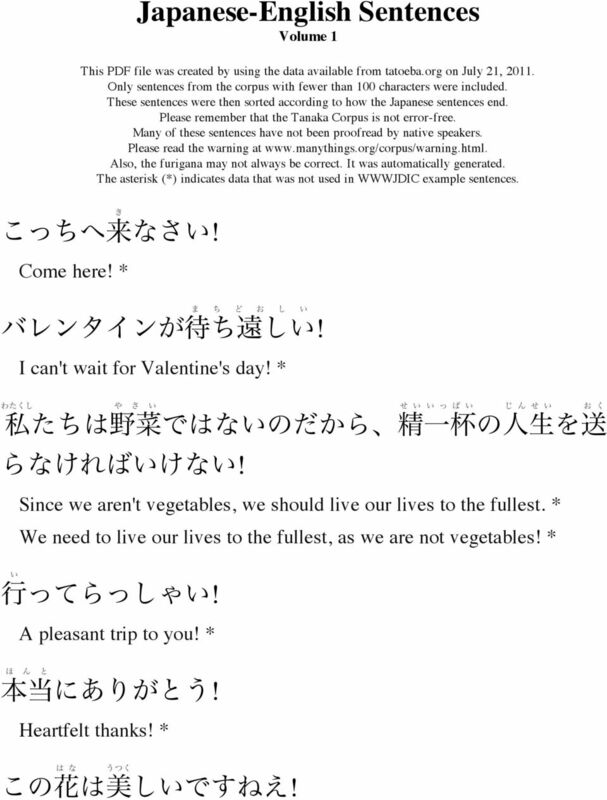 * We need to live our lives to the fullest, as we are not vegetables! *! A pleasant trip to you! *! Heartfelt thanks! *! 10 ? Just between the two of us; are you in love with my sister? * Just between you and me, do you love my sister? *? Do you trust her? *? Have you ever wondered how many stars are in the sky? *? Shall we go to the cinema? *? Can you please tell me where is the nearest church? * Could you please tell me where the nearest church is? *? Don't you have anything smaller than that? *? Did you clean your room today? *? 11 ? Was it interesting? *? Are you tired? *? Just a second, please. Straight and then to the right, is that it? *? It s tomorrow that you re leaving, isn t it? *? What have you done today? *? Have you asked the others? *? Are you mad? *? Will it start snowing at noon or later? *,? 12 Are you free tomorrow evening? *? So, straight, then to the right, and then? *? Are you lost? 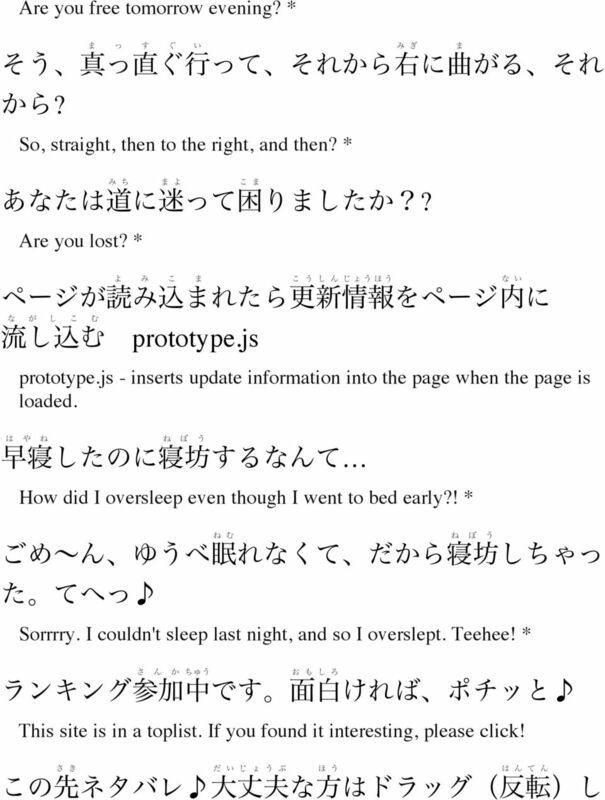 * prototype.js prototype.js - inserts update information into the page when the page is loaded. How did I oversleep even though I went to bed early?! * Sorrrry. I couldn't sleep last night, and so I overslept. Teehee! * This site is in a toplist. If you found it interesting, please click! 13 Spoilers ahead! If you don't mind that then read after highlighting (colour inverting). Noted. Thank You * > > I was born on 23 March 1969 in Barcelona. * My father, having left a large sum of money, * 30UP Around 30% increase in power seen in in-house comparisons with previous model. * If the shoe fits... Men of uncommon ability. 14 Streets and houses were drowned by the flood. Every day I forbear to fall the tears. Speaking words of wisdom, "let it be." "In my opinion," said the younger brother, "you are wrong." Sushi is good, but Thai dishes are better. I hope the weather will clear up tomorrow. I'm disappointed that he's not here. You can't see too well with these LCD displays. 15 I could go for a nice hot pizza right now. I can't find my pen. It's really cold today. You're still green. I wish they would turn off the radio. I don't have enough RAM. 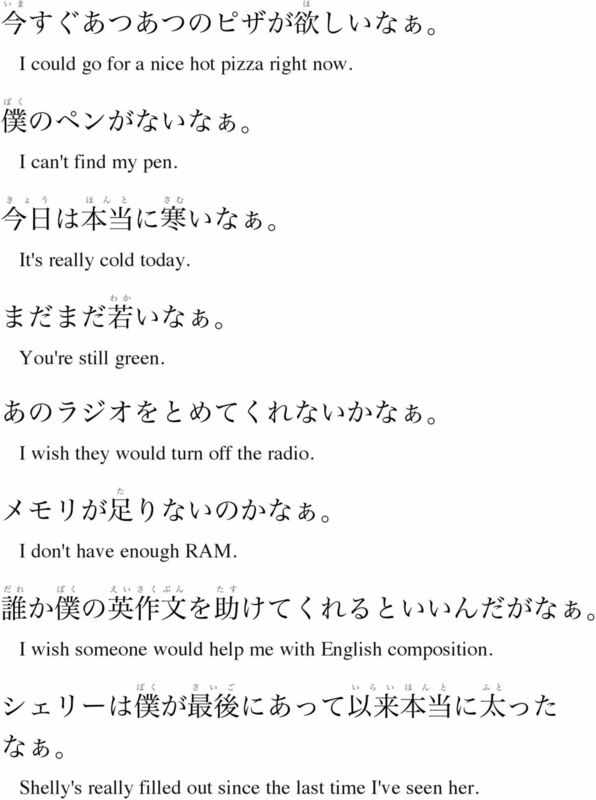 I wish someone would help me with English composition. Shelly's really filled out since the last time I've seen her. 16 It's a lovely day. That girl is good looking. * I wish I had followed the doctor's advice. I wish you hadn't told that story to my mother. I wish you had not told the story to my mother. * I wish I were a bird. If only I knew! I wish I were younger. I wish I could swim. 17 I wish I could swim. Being too busy with work is a problem, but then so is having too much free time. I wish he had attended the meeting. I wish my dream would come true. I wish I could speak English the way my teacher does. I wish I had a car. I wish that she would stop smoking. These presents are really bulky. Dean can really put away the food. 18 If only he would marry me! Well sports day is over too, next the midterms... I wish I was always being sent abroad on business like he is. I hope the weather will clear up tomorrow. I hope the weather will clear up tomorrow. I hope the weather will hold until Sunday. I hope it will be nice. 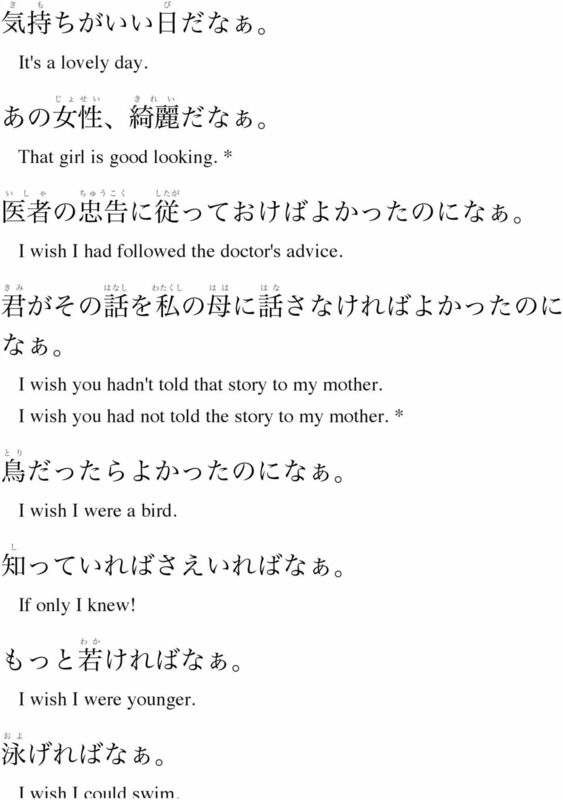 I wish I could speak English like you. 19 That a girl, Marie! It is strange that he should not tell me anything about it. I hope you have brains enough to see the difference. I'd like to take a small trip this weekend. If it's not too much trouble, I would like some help. I want to have a part-time job, too. 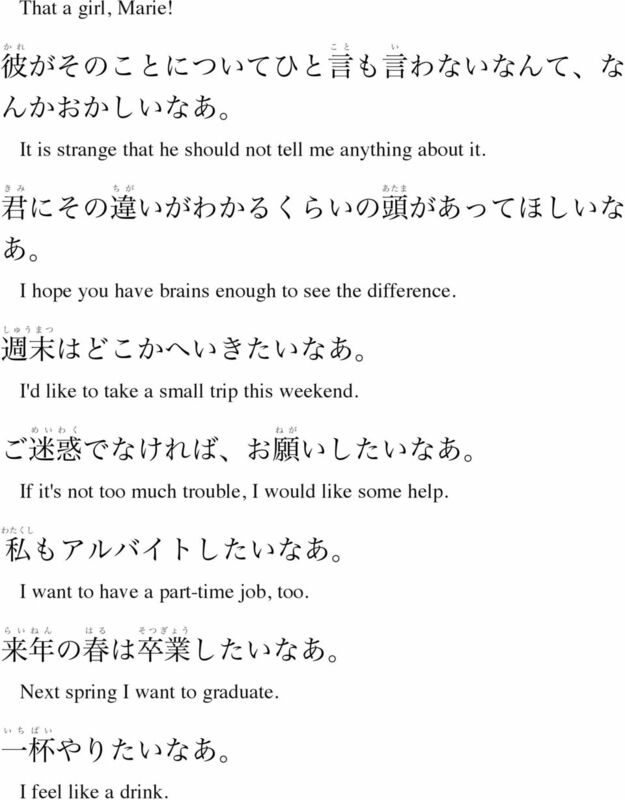 Next spring I want to graduate. I feel like a drink. 20 I really want to know. That's a bit cold. I wish I could think of something to say. What a pain. I just don't know what to say. I don't know what you mean. * I don't know if I still have it. * I cannot help falling in love with her. 21 Ms Sato is no lightweight. I just saw her chug three bottles of beer. That sure puts me on the spot. Are you going out in those clothes? How uncool! * Going out with those clothes? They look kinda bad. * He's a pushover. Foreign people are amusing. 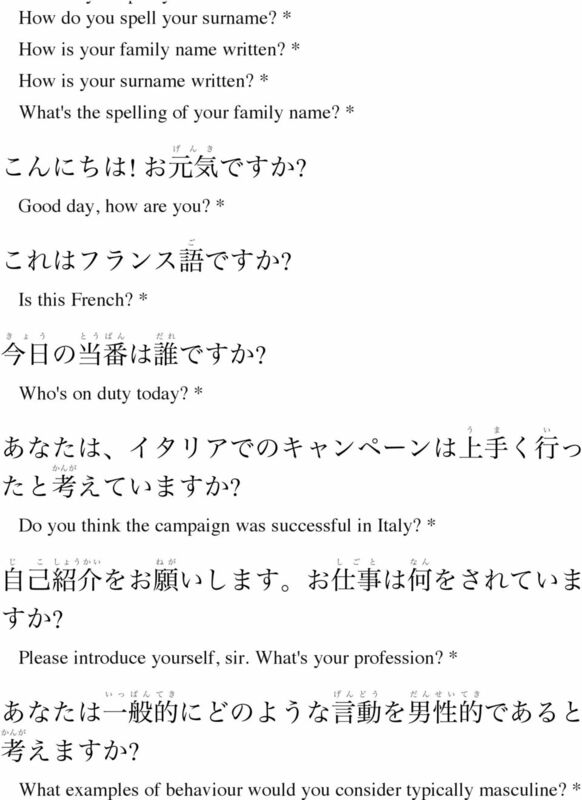 * Foreign people intrigue me. * You're still green. I can't believe my eyes. Would you mind if I borrowed your car? 22 Would you mind if I borrowed your car? I don't know what to say. I was wondering if you'd let me stay with you for a few days. I'd like you to pick up the pace a little on this job. I'm afraid it will be rainy. I wonder if dinner is ready. He said I was his archenemy. How did we arrive at a situation like this? I wonder if the weather will hold. Hmmm, how shall I say this? 23 Hmmm, how shall I say this? Is there going to be a party tonight? I wonder if she will marry him. When will Yuko come to Denver? Can I get you another one? I wish my uncles were men of millions. I wish I were a bird. Were it clear, we would go on a hike. If only he had known! 24 If only he had known! I wish you would be quiet. You've got a good head on your shoulders. Well, after all Japan also cut itself off from the world. I shouldn't have done it. I wish I had studied harder for the test. I wish I had followed his instructions at that time. * I wish I had obeyed his directions. I wish I had seen the film. 25 I wish I had not spent so much money. I wish I hadn't spent so much money. I wish I hadn't seen such a horrible film. Yes, it is. You were three months old then. Now I'm done for. I'm exhausted. Shiroonitake is a poisonous mushroom but it has real presence, and I like it. 26 Aren't you the lucky one? I'm looking forward to seeing him. It was all-or-nothing and we struck out spectacularly. You're tough. It's a grim world. She is beautiful. I'm anxious whether I'll do well at this new job. * A faultless plan is stifling, isn't it. 27 Bored now. * I'm bored. I feel sorry for her. Great weather, isn't it? * Isn't it a lovely day! Ah, this hot water's good! The same old problem. To me he's no different from a million other dull middle aged men. How I wish I could swim. 28 There's no room to study here. If only I had a room of my own! I wish you could come with us. A6%E E3%8 I hope the weather will clear up on Sunday. I wish I had enough money to buy the car. I wish I were a stone. If only I were a doctor. I wish I knew what is wrong with my car. 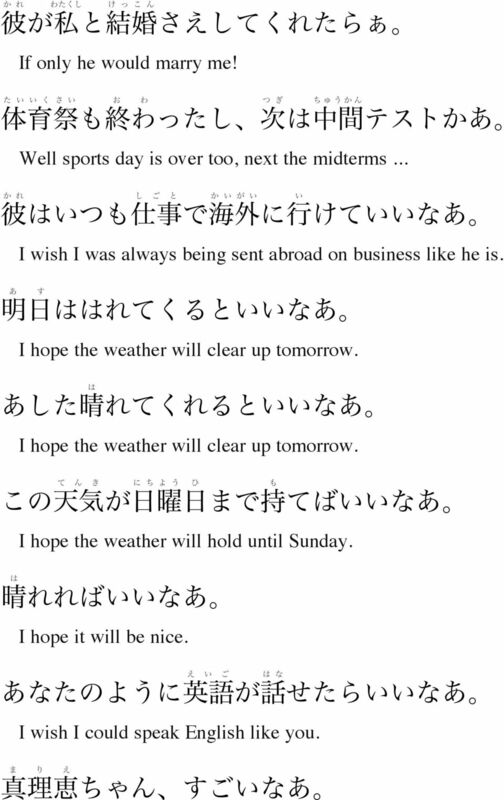 It sure would be nice if there were no exam... * I wish there were no examination. 29 I wish there were no examination. If only I could sing well. * I wish I were a good singer. I wish I were taller. If only it would stop raining! I wish he would make up his mind one way or other. I wish I could buy a motorcycle. I wish I had wings to fly. I wish I were clever. If only I were as handsome as he is. * I wish I were as handsome as he. 30 I wish I were as handsome as he. I wish I could fly like a bird. I wish I were a bird. I wish I had studied harder in my youth. I wish I had married another man. I wish you had come with us. I wish I had got married to her. I wish I had been a bird. Oh man! I was sure this was going to work out. 31 If I were prime minister, I'd give Clinton a good talking to. I wish there was more variety in my work. I wish I were in Paris now. If only I get a chance to see him. I wish I were a bird. We could really use another person around here. If only I had taken your advice. If only I knew the answer now! 32 I wish she were alive now. I wish she were alive now. I wish I knew where he was! I wish we had won the game. I wish I had had a camera then. I wish I could give up smoking. I wish I could see the ancient world. I wish I had a better memory. 33 We wish we didn't have to take a test in English. I wish I were young. I wish I were as young as you. I wish I were young. I'm disappointed that he's not here. If only I could speak English as fluently as she does! If only I could speak French. If only the rain would stop! 34 If only he arrives in time! I wish it would stop raining. If only I could be through with my homework today! He was burning the candle at both ends. If only I had known the answer yesterday! If only the doctor had come a little sooner. If only I had listened to my parents! I wish I had known his name then. 35 I wish I had gone with the others to the game yesterday. I wish I could buy that guitar. I wish I could buy that house cheap. I wish I could break the habit of smoking. How I wish I could go, too! If only I could speak English! I wish I had a room of my own. I wish the subway wasn't so crowded every morning. I wish the subway wasn't so crowded every morning. 36 I wish I were a little taller. I wish you were close to me. The music next door is very loud. I wish they would turn it down. I wish my venture would work out. I only hope that the rain holds off for a few hours more. I wish I were a bird. I wish Jim would behave himself. It's very cold. 37 We'll never live this fiasco down. It's pretty good. Don't be so hard on me. Hey. * I assure you that I won't be late. You should have a doctor check you out. You should see a doctor. * You had better not wake me up when you come in. You had better not waste your money. 38 You had better not waste your money. You had better not go out today. We had better not attend the meeting. You had better not associate with those men. You don't want to make me angry. * You had better not walk around in such a place. You should be alert to the possible dangers. You had better not see her today. You had better not use those four-letter words. 39 You had better take her advice. I'd rather go for a walk than see the movie. We'd better leave her alone. You may as well keep it a secret. I think he should stay away from drugs of any sort. You should keep it close. You had better set some money apart for your wedding. 40 You had better set some money apart for your wedding. You may as well know the truth. I'd rather stay at home. As you have a fever, you'd better stay home. Such a teacher may as well retire from his work. You should discount his story. She'd better tame that violent temper. I may as well go out as stay at home. We'd better take up this issue immediately. 41 You had better do what they say. Better wear out than rust out. You should stretch properly before exercising. * You may as well do the task now as put it off. You had better keep this food under ten degrees. You had better fix the bookcase to the wall. I advise you to be careful in making notes for the lecture. I would rather kill myself than reconcile myself to my fate. 42 You shouldn't make light of a cold. It is better to ignore this point. You had better talk as clearly as you can. You may as well tell me all about it. We'd better finish up this project before the eleventh hour. I think you'd better take an umbrella in case it rains. We should take matters into our own hands. 43 You should get your hair cut. You'd better have your hair cut at once. You'd better go to see your family doctor at once. You had better consult the doctor. * You ought to see a doctor. You should see a doctor. * You may as well see the doctor at once. You should have a doctor examine your condition. As long as you're here, you'd better take a bath. 44 It's raining, so we should go home. Since it's raining, I'd better go home. * You may as well wash your shirt. You had better go now. We'd better get a move on. You'd better go. You should go. * You may as well tell me the truth. You should apologize to him for coming late. I may as well throw the money away as give it to him. 46 You'd better hurry up. We had better call the police. We should call the police. * You had better read a lot of books while you are young. Milk will do you good. You'd better drink it every day. You may as well wait here. It's better as it is. I would take this dress before that one. I would rather stay at home than go out. 47 I would rather leave early than travel on rush-hour trains. I prefer going out to staying at home. Better to be the head of a dog than the tail of a lion. You ought to eat more slowly. You should stay away from cults like that before you turn into a moron. The fish are striking well today. They are well off. My mother is well off. 48 He's in good odor with the chief. Standing as it does on a hill, the house commands a fine view. This soap lathers with soap and water. Which would you rather do, go to a movie or stay at home? * Which would you rather do, go to the cinema or stay at home? Her voice is pleasant to listen to. It is pleasant to shave off my beard. It is very pleasant to sail these waters. 49 I feel good in a special way. I feel good in a special way. He is rich, what is more, he is well-bred. The rice is coming well this year. In order to stay awake I may have to drink more coffee. You can get a fine view of the sea from the mountaintop. She is friendly to everybody. She is very photogenic. He is in favor with his superiors. 50 This tea smells good. This wine is superior to that one in scent. Before buying anything, you had better ask yourself whether you cannot do without it. Her father is liberal with money. I like cold potato salad in the summertime. She has a good figure. Keiko has a good figure. He has a nice build. 51 She has a very good figure. I like coffee better than tea. She is good-natured. I am on good terms with him. You and I are very good friends. I feel all the better for a hot bath. He feels a good deal better than yesterday. How generous you are to give me so much money. 53 Six o'clock will suit me very well. You have good taste in clothes. This train rides very well. The young man is a handsome figure. My husband is in high spirits today. My boss is very cheerful today. He is really in good shape. This car is in good condition. 54 The chemistry is right for us. I get along well with her. She is amiable to everybody. He makes himself agreeable to everybody. That is a well-managed company. You had better not go there again. You'd better not do it. It is better not to go out of your field. You had better not sit up late up night. 56 It's better to carry plastic chopsticks and wash them than to use disposable chopsticks to throw away. It would be better to leave it unsaid. You may as well keep it a secret. It makes sense to pay off your credit card balance every month. You'd better leave him to do as he likes. You may as well know the truth of the matter. You had better leave it unsaid. You'd better take his words with a grain of salt. 58 You had better make the most of your opportunities. We may as well start at once. You had better leave there on Monday. Better to get advice from your lawyer. You'd better take your umbrella, just in case it rains. You had better take your umbrella in case. In any case you had better obey your parents. I would rather you had a day off. 59 I would rather you had a day off. You had better have your hair cut. You had better see a doctor at once. You'd better see a doctor. You had better consult a doctor about your health. You may as well keep your promise. We had better protect our eyes from direct sunlight. This holiday isn't much fun - we should have gone home. You had better go home as soon as possible. 60 We had better sit down here. We should sit down. * You'd better go in person. You should go in person. * At any rate, you had better go there. You had better look up the word. You should eat more vegetables. You should eat some vegetables rich in vitamins. She had better eat breakfast. It would be better to try. 61 It is desirable that you stop smoking. You had better begin with easier questions. You should begin with easier questions. * You had better give up smoking for your health. He should be put in prison. You may as well get used to it. There's nothing to do, so I may as well go to bed. You had better go to bed early. You may as well come with me. 62 Your shirt is torn. You better put on another shirt. Since it's cold outside, you'd better put your overcoat on. These pictures look better at a distance. You had better see the cloth with your own eyes. We had better call the doctor. We should call the doctor. * I would rather die than do it. I would rather die than do such an unfair thing. 63 You had better read your teacher's comments on your compositions one more time. I prefer payment in full to payment in part. I prefer to work on my own. I prefer going for a walk to seeing the movie. The former is better than the latter. I prefer fish to meat. I would rather be poor than be rich by taking advantage of others. I prefer being poor to being rich. 64 I would rather remain single than live an unhappy life with him. You may as well return home at once. You may as well leave at once. It's better to take your time than to hurry and make mistakes. John is easy to please. On the whole, my company is doing well now. The computer industry is enjoying a boom. He is doing fine in school. 65 He is doing fine in school. The boy has a good school record. You are doing well for a cub reporter. This carpet is superior to that one in quality. My sister is quick-thinking. You're in luck. She is as intelligent as he. My sister has a very good brain. She is no less clever than her sister. 66 He is not less bright than his brother. He is no less smart than his brother. He is clever indeed. You are sharp. That boy has good brains. That boy is intelligent. * That boy is smart. * He's intelligent. * He's smart. * He has a good brain. He has a good head on his shoulders. * He is more clever than wise. 67 He's brighter than they are. * He's smarter than they are. * He is cleverer than they are. She is smarter than he is. * She is very intelligent. He is the brightest in the class. The weather is as fine as can be. No matter what he plays on the screen, Tom looks great. It is pleasant to sleep under the tree. It is nice and cool here. 68 It is nice and cool here. You can rely on him. You can trust him. You may go anywhere you like. You may take the book home so long as you don't get it dirty. You may always use my dictionary. You can use my car, if you want to. In order to know a man, you have only to travel with him for a week. 69 You have only to ask for his help. All you have to do is to hand this book to him. In art, as in love, instinct is good enough. * Two o'clock would be OK. * It's so nice to be by ourselves. You should allow for a few rainy days on your trip. This is better by far. Compared with last year, this year's crops are much better. 70 My camera is much better than yours. I'm taking care of it. You can relax, you can rely on me. Trust me. It'll be plain sailing. * If you haven't driven a bike yet, you should give it a shot. The soft blanket is fit for a baby. These shoes are big enough for me. The sooner, the better. Dancing is good for the figure. 71 If he comes so much the better. Eating fish is good for your health. I'm quite all right if you have no objection to it. He is well paid. He has a good school record. If your essay is on the short side, you can always pad it out with a few quotations. What time can I be there? All you have to do is to wait. 72 You have only to watch what I do. You have only to sit here. All you have to do is wash the dishes. You have only to do as you were told. All you have to do is sign your name here. All you have to do is press the button. All you have to do is wait. You have only to ask him if he'd like to join us. 73 All you have to do to secure a seat is to wait in line. To understand it, you have only to read this book. You have only to read a few more pages. You have only to give him a little help. All you have to do is apologize for being late. You have only to go with me. Finding one's way around Nagoya is very simple. All you do is look at the signs. You have only to study hard. 74 In an emergency you can fall back on your savings. In order to know a man, you have only to travel with him a week. You can put it anywhere. He doesn't have to go to school today. Don't worry about making lots of sales. You can go out, as long as you promise to be back early. You may give this picture to whoever wants it. I'll bet anybody on that. 75 I'll bet anybody on that. May I ask you a question? You may invite anyone you like. * You may invite whoever you like. Can I be excused? You may leave the baby with me for two days. You can go or stay, as you wish. You can use this car. You may use this car. * You can smoke in this room. 76 Now that school is over, you can go home. Can I go swimming, Mother? Mama, is it okay if I go swimming? * Mom, can I go swimming? * Mommy, may I go swimming? * May I go to the movies tonight? You may go as long as you come home early. That is most agreeable to the taste. The movie is drawing pretty well. Looks aside, she is very good-natured. 77 You can have any cake on the table. Can I have a bite? She is not only beautiful but also amiable. You can watch TV after supper. It makes no difference whether he comes or not. It doesn't matter whether you win or not. It makes no difference to me whether he comes or not. The choice of presents makes no difference to us. 78 Anywhere with a bed will do. I would prefer any alternative to a lawsuit. You can read this book. You may read this book. It's OK to leave the baby to cry on occasion. She has a good memory, too. The position carries with it an attractive salary. He is good-looking and smart. His paper is superior to mine. 79 They are pretty. You are not less pretty than her. You're such a cute boy. The baby sleeping in the baby carriage is as cute as an angel. Robin looks very cute when he's sleeping. She is more pretty than beautiful. The baby in the cradle is very pretty. She is very pretty. 80 The cat is very cute. She looks pretty no matter what she wears. Helen is more pretty than beautiful. She is more pretty than beautiful. She is more pretty than beautiful. That girl is more cute than beautiful. I feel much better today. Anybody is better than nobody. 81 I prefer meat to fish any day. If you travel in China, it is best to go with a guide. It is best to review the material before the presentation. It is best left untouched. This garden is at its best in summer. I've visited many countries, but I like Japan best of all. Her eyes are her best feature. Paris is best in autumn. 82 I'm not a university student, but I'm brighter than them. Relations are tenuous as peace talks resume between warring factions. Bill often fails to keep his word. Many people are against the bill. We have a lot of sympathies in common. My grandfather is a bit hard of hearing. Can I use this dictionary of yours? We could meet downtown. Would that be convenient for you? Are you ready? 83 Can I count on your loyalty? May I eat a little of it? Can I borrow your tennis racket today? Excuse me, Joe, can I use your phone? Do you think it's funny I feel so? Why don't we drive out to the country for a change of pace? Do you feel like going out for a drive in the country over the weekend? Don't you get on each others' nerves? 84 What's new? Do you want to look into it? Will you please adjust the clock? It's slow. Can I play the stereo? Do you wonder that no-one trusts him? Do you think he made that mistake on purpose? Do you think he made that mistake on purpose? Do you think Dad will change his mind? 86 Is anything up? Have you heard from him recently? Tom is flush with money since he got paid today. Didn't you see a dog pass through the yard? Did you make any money out of that business? Could you make out what he was saying? Did you have a good time this afternoon? Did you do the last problem of the homework? 87 Did you do the last problem of the homework? Have you finished yet? Could you get the train at 11 last night? Have you washed your hands yet? Could you make out what he was saying? Did you rent an apartment? Has he come yet? I missed seeing the film. Did you see it? Have you seen my new car? 88 Did you read the whole book? He is almost professional. Was this somebody else's idea? Are you younger than him? Have you done with the book? Did you fall in love with her at first sight? You seem to be depressed this morning. What's the matter? How did you come to know her? 89 Have you finished already. Did you meet her? Are you sure you've never met him? Mike, do planes usually rock like this? Are you interested in that girl? What are you doing dressed so well? Do you have a date or something? Have you been seeing a lot of him recently? Have you got any plans? 90 How's things at the office? This cloth feels soft. Silk feels soft. The meat is smooth and soft. It is soft to the touch. Here are two pencils: one is hard, and the other soft. This beef is tender. The petals of this rose are very tender. 91 Are you going to cry till the cows come home? What are you going to be when you grow up? Are you going to attend the meeting? What's on the air this evening? Have you ever visited the office where your father works? Have you ever seen a koala? Do you have a fever? * Do you have a temperature? * Have you any fever? Is there enough money to get a bottle of wine? 92 Is there enough money to get a bottle of wine? Do you remember the day when we met first? Do you really love me from the bottom of your heart? * Do you happen to know anything done by her alone? I wonder if you have something to write with. Do you know who that tall blonde girl in green is? Do you know why he has been absent from school? Can you figure out why the boss is so unfriendly this week? 93 Can you make sense of this poem? Do you want to come along? Can you swim underwater? Can you swim underwater? Do you have a pen? * Have you got a pen? Do you know what day it is? Do you know my brother Masao? Can you pick it up? 94 Can you make it on time? Can I borrow one for about two weeks? Can you hold on a little longer? Arnie, can you hold on until help comes? Is there enough food for everyone? * Is there enough food to go around? Will you pay off the damages in full on the dot? It is warm, not to say hot. The climate of Japan is as warm as that of China. 95 It is as warm today as yesterday. My overcoat is light but warm. I have plenty of money with me. He seems to have a fat purse. It's balmy today. It is warmer over the mountains. It's warm for this time of year. This coat is warm. This sweater is warm. 96 This sweater is warm. We are having a mild winter. This winter is warm. It is pretty warm today. This room is very warm. It is nice and warm today. The climate here is milder than that of England. The climate of Kochi is warmer than that of Kyoto. It is rather warm today. 98 Wow, that's so big. * This house is about the same size as Peter's. This is about as large as that. * This is as large as that. I am about as big as my father now. This cat is as big as that one. This car is as big as that car. My brother is as large as I. * George has an incredibly large Adam's apple. 99 At this rate the risk is high that our country's competitive position will drop even further. He owes much of his success to his wife. Salt water is more buoyant than fresh water. Shh, you're speaking too loudly. He has a loud voice. He has big hands. He has a generous nature. There is a great market for rice in Japan. 100 John talks big. Actions speak louder than words. A turkey is a little bigger than a chicken. Pears are running large this year. The earth is far bigger than the moon. The sun is much larger than the moon. The speed of light is much greater than that of sound. London is large, compared with Paris. Asia is much larger than Australia. 101 Asia is much larger than Australia. That football player is gigantic. This building is very large. These dogs are big. * The shirt is large for me. Those apples are big. That dog is big. Those dogs are big. These dogs are big. 102 The media has a lot of influence on the outcome of an election. He has a loud voice. Your house is big. * My house is big. That dog is big. * This dog is big. There is a great demand for gasoline. There is a big market for coffee. These cars are big. 103 These cars are big. The impact of science on society is great. The influence of TV on society is great. This fish is big. America is very large. This classroom is very large. The bookstore across from the station is very large. This desk which I bought yesterday is very big. The building built last year is very big. 104 Ken's dog is very big. * Ken's dog is very big. China is much larger than Japan. * This animal is bigger than that one. Tokyo is larger than any other city in Japan. Towns are larger than villages. Tokyo is bigger than Yokohama. * The elephant is bigger than all the other animals. The elephant is the largest land animal. 105 The elephant is the largest land animal. The chances are very good that our team will win. Also, there is a greater risk of accidents. My hat is bigger than Jim's. My shoes are bigger than yours. Our school is larger than theirs. Tokyo is larger than any other city in Japan. The sun is larger than the moon. Canada is larger than Japan. 107 Big cities have too high a potential for riots. He is hard to deal with. He is hard to deal with. He is hard to deal with. Her boss is hard to deal with. He is hard to deal with. Such a problem is hard to deal with. Plastic does not burn easily. Your question is hard for me to answer. 108 Your question is hard for me to answer. This question is difficult to answer. Your question is hard to answer. It's hard to imagine a life without pets. It cannot reasonably be assumed that decreasing the dose would reduce the risk of side-effects. 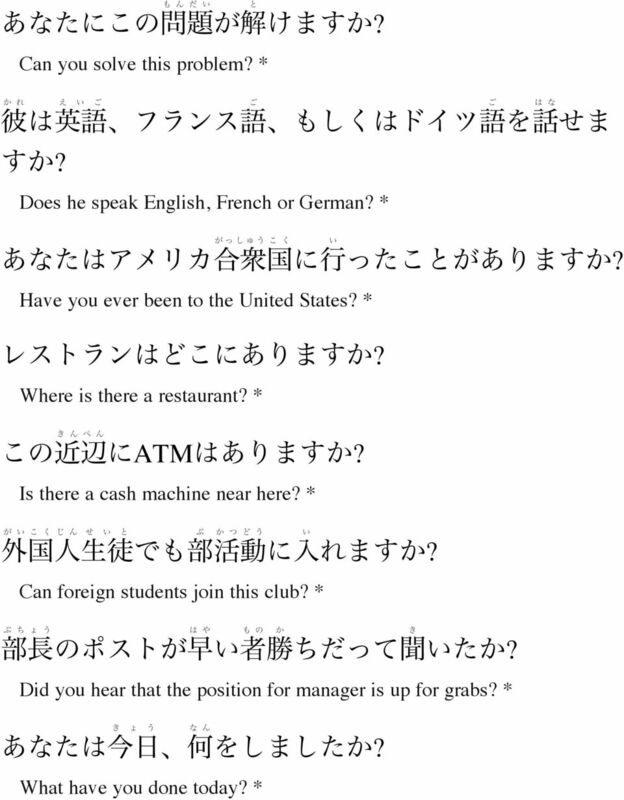 It is hard for foreigners to learn Japanese. Greek is difficult to learn. This city is hard to live in. 109 Life is getting hard these days. From the practical point of view, his plan is not easy to carry out. It is difficult to understand why you want to go. Frankly speaking, it is difficult to understand why you want to go. His ideas are difficult to understand. The reason which he gave is hard to understand. 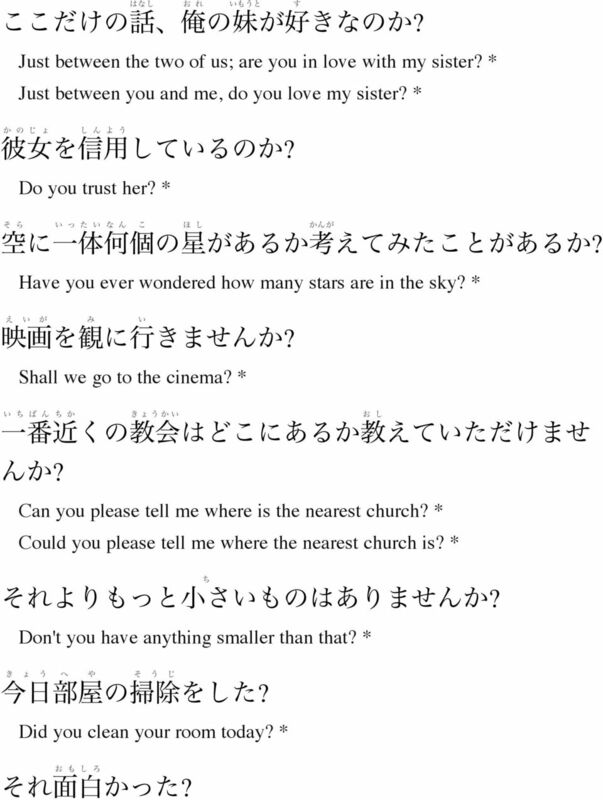 This novel is difficult to understand. This word is difficult to pronounce. It is hard to convince Jack. 110 It rains so often in the wet season that it's hard to plan outings. Russian is very difficult to learn. Written in technical terms, this book is very difficult to understand. My uncle's handwriting is hard to read. The medicine is hard to swallow. Much legal language is obscure to a layman. He is hard to please. The president is difficult to approach. 111 Truth is difficult to find at the bottom of a well. The taller a tree is, the harder it is to climb. Plastic does not break easily. Jobs are hard to come by with so many people out of work. He is very bright, and his brother is as bright. Both the boy and the girl are clever. He is more crafty than wise. A sparrow is very alert in its movements. 113 I'm a bit serious today, but please bear with me. Give me another cup of coffee. Get me a glass of milk. Please give me a cup of milk. * I'm thirsty. Can I have a glass of water? Please give me a cup of tea. I'd like two one-way tickets from A to B Be my guest. Be my guest. 114 Be my guest. Use only as directed. You are welcome to any book in my library. The money is at your disposal. Here's a pen for you to use. You are free to use this dictionary. This elevator is out of order. Please use the stairs. You may use my bicycle such as it is. Stay with me, ladies and gentlemen. 115 Stay with me, ladies and gentlemen. I'm sorry, you have to pay for the extra weight. Please pay the tax. Give my best regards to your parents. Send my greetings to your wife. Please remember me to your mother. Remember me to your parents. Please give my best regards to your mother. I hope you will give my best regards to your family. 116 I hope you will give my best regards to your family. Please say hello to your family. Please remember me to your teacher. Please remember me to your parents. Please give my best regards to your parents. Next time you see her, give her my best wishes. Please give your mother my best regards. Best regards to your father. Passengers going to the Chuo Line, please change trains at the next stop. 117 Passengers going to the Chuo Line, please change trains at the next stop. I wish you a Happy New Year. All the best wishes on this wonderful day. Please give me something to kill the pain. Please sit at the table. Put down your name and address here. Put down your name and address here. Write your name and address, please. Leave your hat and overcoat in the hall. 118 I do beseech you, hear me through. Now, before I say any more, listen to this; Please make yourself at home. Please sit on the sofa and relax. * Sit on the sofa and feel at ease. Come to see me at any time tomorrow afternoon. Go any time you want, tomorrow afternoon. Please take care of yourself. Please take your seat. 119 Here, please have a seat. Please sit down on this chair. Please check your valuables at the front desk. Please come over with your wife. Will you step this way, please? Please hand this in at the front desk. Please take a bath. After you with the salt. 120 If there is any left, give me some. I'd like some more butter. Give me a few. Give me just a little. Please give me some water. Give me some water, please. Give me a little money. Please pardon me for coming late. I beg you forgive me. 121 Please excuse my bad handwriting. Please come again. I do hope you will come again. Please come here soon if you don't mind. Please come to my house by all means. Please come and see me next Sunday by all means. Stop beating around the bush and tell us what you really think. Could you share your honest opinion on this issue? 122 Please tell me what you think about this article. * Please let us know. I would like to know how you will proceed in this matter. Would you please let me know what the status is right away? Let me know if I need to make any changes. * Let me know your departure in advance. If you have any questions, please let me know. If you should need any help, just let me know. 123 Please respond at your earliest convenience. Let me know the result as soon as you can. Please let me know the status. Please let me know the schedule beforehand. Do you have volume discount? If so, please send details. As soon as you have the car fixed, please send me a letter with the cost. I'll send you the money. Please send reports of mistypings and mistranslations to the address below. 124 below. Show your ticket at the barrier. Move along, please. Hold on a minute, please. Wait in the waiting room. * Please have a seat and wait until your name is called. Please sit here and wait. * Please sit on this chair and wait. * Please wait till he comes back. Wait in line, please. 126 Give me one millet dumpling, please. * I'd like three of these. Two sodas for the children and one coffee, please. Please give me a map of the town. Two beers, please. Give me three ice creams, please. Waiter, three coffees, please. If anybody calls, get his number. 127 Remember to mail this letter tomorrow morning. You must remember to tell him all that you know. Charge it to my account. Charge it to my room. Put a tag on the pages you want copied. Please come thirsty. Please leave me alone. Please get my account ready by tonight. 128 Do not leave our generation without hope. If you make a mistake just cross it out neatly. Please go over the script. Please keep me informed of whatever happens in my absence. Please keep this money for me. Please reserve this table for us. Please save my place. Please leave me alone. 129 Keep the change. Keep the change, please. Please keep my place in line. * Please keep my place in this line. Keep an eye on my suitcase while I get my ticket. If you happen to see him, please give him my best regards. Please give my best thanks to her. Keep an eye on my suitcase while I buy my ticket. 130 Please hold the line. Please put the book on the shelf. If you are not in a hurry, please stay a little longer. Please beat the rug, first. Please wait here. Please remember to write to her. Please keep quiet. Stay quiet and rest. 131 Please breathe through your nose. Bite down tightly, please. Please remain seated. Be waiting here until he comes. Please wait here until he comes. * Wait here till I come back. Please wait until I have finished writing this letter. Please wait for me at the entrance of the building. Please wait outside of the house. 132 Please wait around for a while. Keep mum about this plan. You should stay in bed. You should stay in bed for three or four days. Hold still for a moment, please. You can always reckon on me. Bite down on the cotton roll. Put it on my father's account. 133 In case you see him, give him my regards. Please stay within call. Please stay here till I get back. Please put on your slippers. I'd like two prints of each. Turn to the right. Turn to the left. Turn toward me, please. 134 Please put on your shoes. Please put your shoes on. * Play Chopin for me. Will everyone please stick with it to the last moment. Draw a chicken before cooking. Remove the chicken's giblets before cooking. * Write with a ballpoint pen. Write your name in capitals. Please write in a way that concretely conveys the question. 135 Please write down your contact address here? Could you write me directions to the restaurant? Please write back soon. Please write your name with a pencil. Please write your name at the bottom of this paper. Please write down your name here. Please put down your name in this book. Write the receiver's name here, please. 136 Write your address here. Write down your date of birth here. Please remember to write to her. Please simmer the beans for a while over a low heat. I like my steak medium. If the list of books is too long, please leave out all foreign books. Please keep yourselves calm. Keep these seats for the elderly. 137 Get them out of the way. Lay these books on my desk, if you don't mind. Please put this book on the very top. Put this book on top of the others. * Stick the bag down under the seat. Please keep this book at hand. Put the ashtray within eyes reach. Put the book on the top shelf. Put the book on the bottom shelf. 138 Put the book on the bottom shelf. Keep out of reach of children. Please put this where children can't reach it. * Put those flowers wherever we can see them well. Please put it on the scale. Put the box wherever you can find room for it, please. Ask him where he parked his car. I beg of you to listen carefully. Please listen carefully. 139 Listen to some more from the scene. Listen to me carefully. Please note my words. I'm begging you, before freaking out on me listen to the end of what I have to say. Don't interrupt me but hear me out, please. Mark in red anything you don't understand and ask about it in class. Ask at the police box over there. 140 Hear me out, please. With regard to the membership fee, you must ask the treasurer of the club. Ask him when to get together next. Please don't hesitate to ask me any questions. If you have a question, please ask me. Please ask me any time you have a question. I'll give you five minutes to work out this problem. Please answer this question for me. 141 Please open the file circled in red with a text editor. * Please remove the mud from your shoes. Please remove the ashes from the stove. Please put on these slippers. Could you change my room to one with a view of the ocean? Hold the button down until you hear the shutter make a clicking sound. Say, Mike. Tell me how to get to your house. Tell me the more exact time. 142 Someone! Catch that man! Give me another chance to try. Please give him detailed and specific directions. If you should see Celia, give her my best wishes. Will you give my best regards to your sister? Give my thanks to your son. If he should call me, please tell him I'll be back in an hour. 144 You have to give up sports for a while. Please refrain from smoking in public places. Don't drink any alcohol. You must not take either a shower or a bath. Please refrain from making posts that disrupt this site's atmosphere. * Please refrain from making posts that make this site less pleasant to visit. * Please refrain from posts that might encourage conflict. Please refrain from smoking. You should not drink a lot of liquid. 145 I'd like to cash a travelers' check. Please cash this check. I want to know if you will refund the full purchase price. Please inform me what options are available to me. Tell me which one to choose. Please advise me what to do. What number bus do I take to get to Waikiki? 146 Please tell us what to do next. Please tell me where to park my car. Please tell me where to go next. Please advise me what to do. Please tell me what I should do. * Tell me when to call at his office. Please tell me what I should do first. Tell me what you did in Hawaii. Tell me what you did in Tokyo. 148 Let me know why it was that he came suddenly. Please tell me where you will live. Tell me what you did on your holidays. Could you tell me which bus or train goes to the center of the town? Please let me know how you are going to solve. Tell me how to beat sleeplessness. Please tell me when you are coming back. Please tell me when he'll be back. 149 Please tell me where the police station is. Tell me where the police station is. * Tell me where the meeting will be held. Please tell me when the next meeting will be held. Please tell me how I can get in touch with him. Could you tell me where I can find the baggage for flight JL 123? Tell me when you are through with your work. Teach me some kanji, please. 150 Please tell me why you don't eat meat. Please explain in detail. Tell me exactly where he lives. Please let me know. Tell me why you want to go there. Take home these paintings of his and tell me what you think of them. Please tell me which to take. Please tell me when to leave. Please tell me when to go. 151 Tell me what you have in your hand. Tell me how to spell the word. If you want to include other information, please let us know. Please let me know when we get there. Please let me know if it hurts. If you know the answer to this question, please tell me. * Tell me where she lives. Tell me something about your family. 152 Please tell me how to spell your name. Excuse me, could you tell me the way to the post office? Could you tell me how to spell the podium of an awards ceremony? winner's stand? How do you spell your name? Tell me what I should be watching for. Spell your name, please. Can you please let me know the most suitable person in INF Co., Ltd? 153 Please let us know your conditions for making the concession. Please show me another example. Let me know where you are staying. Tell me the exact time when the next train will arrive. Could you tell me the ETA? Please tell me your name. Please tell me your name. * Tell me what your name is. Please tell me your name. 154 What's the name of your pharmacy? Tell me about your successes in business. Give me your telephone number. Please tell me your name and telephone number. Could you give me the name and phone number of a doctor? What's your name and flight number? Please show me the meaning of word. Tell me what your hobby is. 155 What movies are playing this week? Please tell me where the bus stop is. Let me know your new address. Please tell me your address. Please give me your permanent address. Please tell me your present address. Please tell me your location. Please tell me a place to read books. Will you show me the way to use the camera?